When "Mr Poluski" came to visit Pip and Lilian, it would be an absolute treat for the children because he was such fun. As old ladies, Pip's daughters would still laugh at his antics as they reminisced together, particularly recalling the "funny walk" he would put on to entertain them. This group was photographed in Margate when Pip and family were at The Ship Hotel. 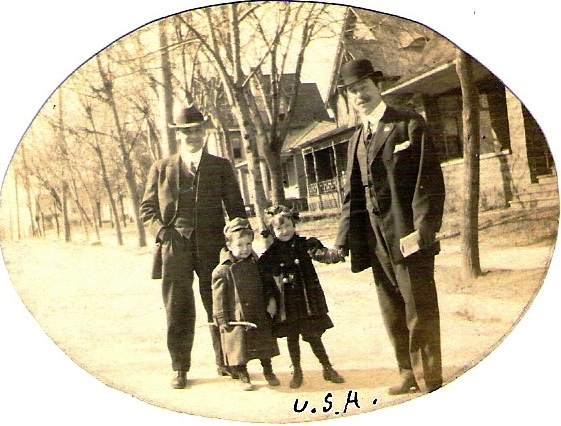 The photo is dated 1920, and the central figure between Pip and Lilian is the only one not named, and I'm sure that Lilian told me it was Will Poluski. Here's another photo taken at Margate showing my mother Winifred, the little girl who so enjoyed Mr. Poluski's visits, and Lilian far right. There are numerous clippings showing Poluski(s) on the bill with The Zanettos over the years. In 2014, George's granddaughter Wendy shared these photos of Pip and George (haven't found the date and place yet). 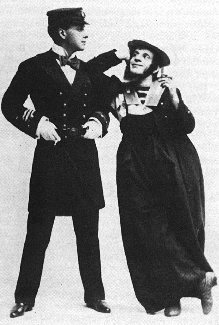 In "A.J" Marriot's book on Chaplin, I came across the following programme dated 1899, with The Poluskis on the same bill as the Bale Troupe. Although they are not billed as The Zanettos, these Bales are most certainly part of the family. Various references to them have been found by cousins Karen and Terri during their extensive research (pages related to the various Bales to be added). This photo of George in the USA always intrigued me. I find it very attractive, but couldn't understand why my grandmother had kept it because I had no idea who the other man was. However, after I'd spent some time working on this page, the resemblance was suddenly very clear, it is surely Will Poluski (with his children? ).